This one is for all the berry lovers out there. 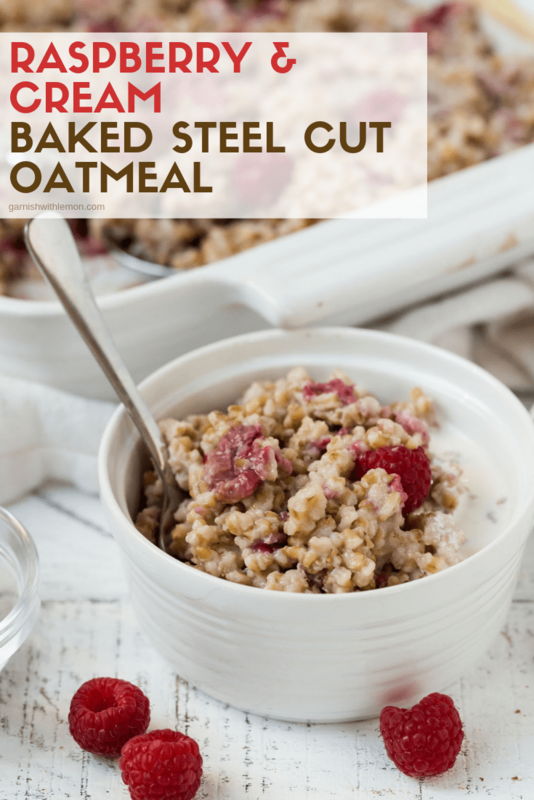 This Raspberry and Cream Baked Steel Cut Oatmeal is a great way to start any day. Steel cut oatmeal holds a special place in my heart. I used to think of oatmeal as boring and mushy, that is until I had steel cut oats on our honeymoon in Ireland. Granted it also may have been the best oatmeal I ever had because I was experiencing Ireland and all of its beauty for the first time, but that was almost 16 years ago and my love for oatmeal is still going strong. So I think I can now officially state that I just love oatmeal. And I don’t think oatmeal gets the love it deserves. 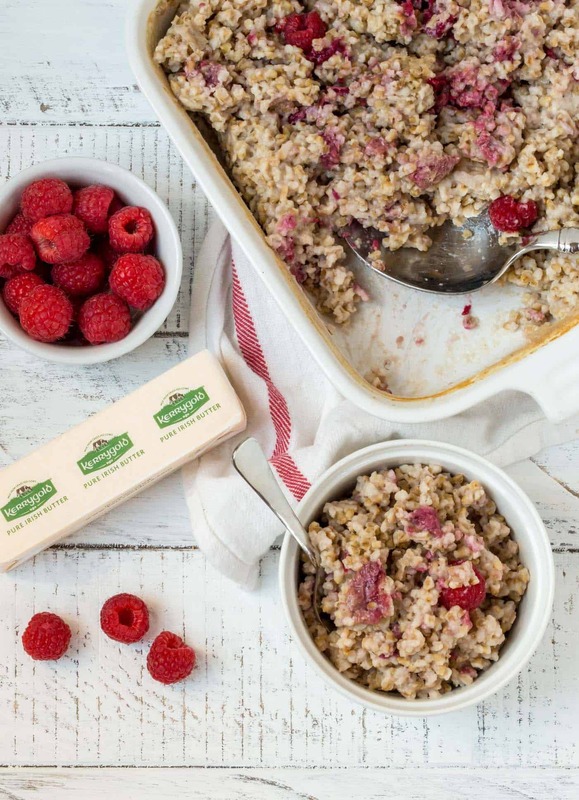 But one bite of this Raspberry and Cream Baked Steel Cut Oatmeal will turn anyone into an oatmeal lover. The texture of steel cut oats is second to none and the flavor gets ratcheted up a notch when they are toasted in butter before they are baked. Don’t skip this important step! It’s hard to believe the flavor that a quick 5-minute spin in none other than my favorite Kerrygold butter brings out. The nutty flavor can’t be topped. Hosting guests for the weekend? You can easily double this recipe and feed a crowd. Because the oven does all of the work, you can sit and have a cup of coffee while it bakes. Add some fresh fruit and muffins, and breakfast is done. 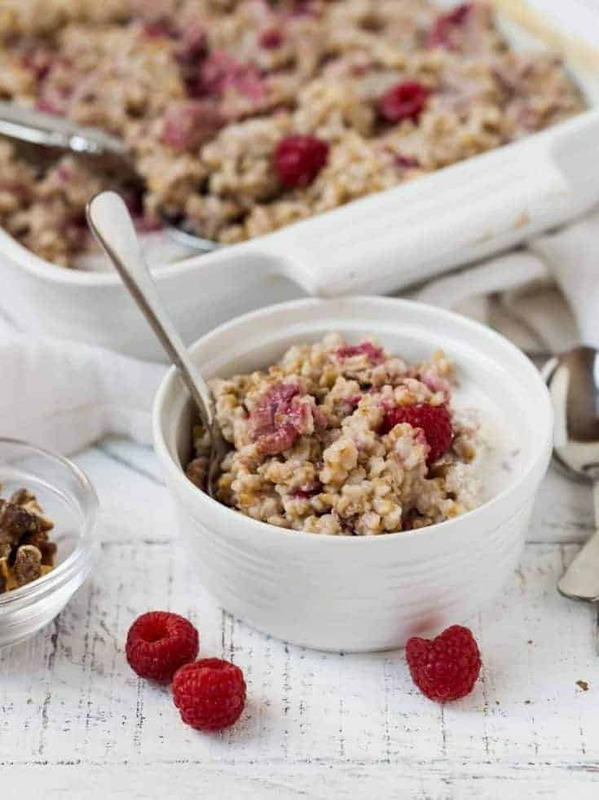 Nutty, delicious and filled with berries in every bite, this Raspberry and Cream Baked Steel Cut Oatmeal is pretty much the perfect way to start any day. Looking for some more oatmeal recipes? Preheat oven to 375 degrees. Grease 8 x 8 pan and set aside. Melt the butter in a small pan over medium-low heat. Add oats and stir for 5 minutes until toasted. Remove oats from pan and place in medium bowl. Add salt, vanilla and sugar and stir until combined. Pour boiling water over oats and stir to combine. Add milk and stir again. Pour oat mixture into prepared pan and top with raspberries. Baked for 55-60 minutes or until oatmeal is set. Don't use quick cooking steel cut oats for this recipe. I am thinking about trying to make this in half pint canning jars. It seems that it might work well, and then I would have some prepackaged, individually portioned, healthy meals for breakfast, as well as the occasional afternoon snack. I love the idea of putting glass baking containers inside the crockpot!